I’m never quite sure whether to be impressed or frustrated at what seems to be a typical British over-optimistic assessment of our weather. I think on the whole I verge towards frustration. Having lulled us into a false sense of security by allowing us to begin our trip with four or five very pleasant, essentially sunny, days, nature has more recently been making us pay, and pay dearly. We began paying with “cyclonic” winds battering us with rain for the best part of 24 hours and have continued paying with what will have been at least five subsequent days featuring various quantities of rain, several of which were large. Oh, and let’s not forget the hail. 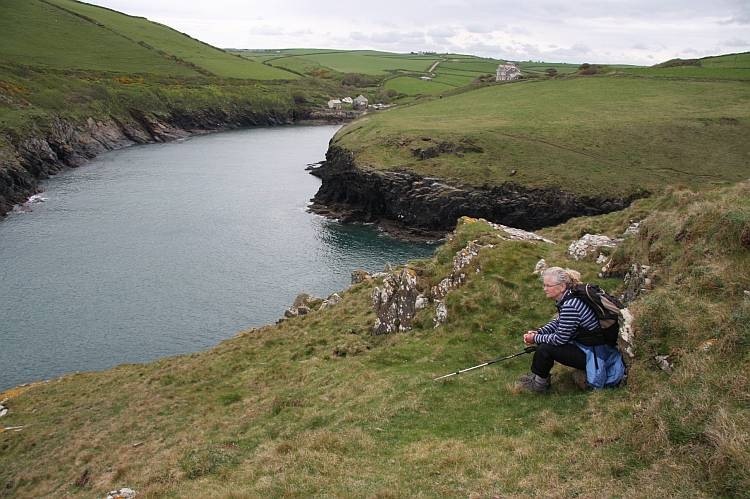 With this background, we began our walk and soon met a couple on the coastal path. As I eyed the approaching solid dark mass of cloud in the west that would bring this afternoon’s rain, they greeted us with a cheery, “lovely day”. “Well, so far it’s OK”, I reluctantly allowed. “It’s nice at the moment”, amended the lady. Nice? Further along our walk, what turned out to be an advanced guard of the advertised band of rain began spitting at us. We met another couple. “Isn’t it beautiful?”, said the lady of the couple as sporadic rain spots splashed on my unprotected head. Really, this ridiculous over-generosity was just more than I could take. “It might be alright without the rain”, I retorted. 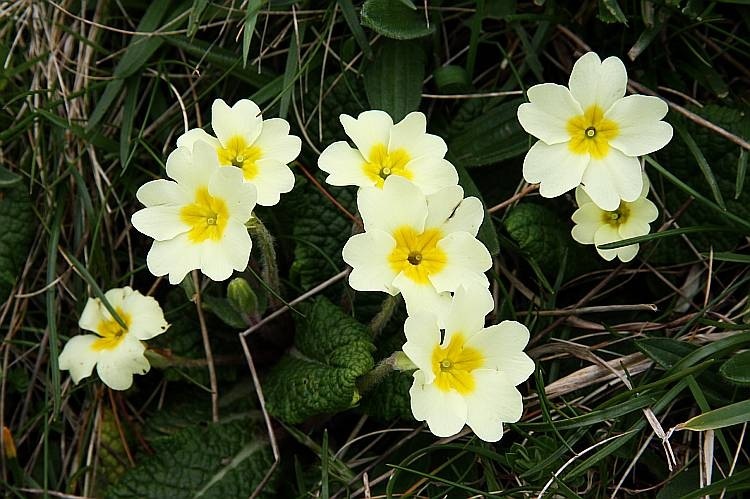 “But the primroses are so lovely, don’t you think?”, she tried. Ye Gods! “Yes, indeed the primroses are lovely; all the spring flowers are an absolute delight”, I agreed, thinking that it was little short of a miracle that any delightful spring flowers remained after the severe battering they must have sustained from Mother Nature over the previous week. Is it a mark of just how bad our British weather is that people assess a grey day with approaching storm clouds as “lovely” or “beautiful”? The light may be flat and unscintillating doing nothing to flatter nature but it’s “beautiful”. Are we that undiscerning? It seems to be a lovely or beautiful day if it isn’t actually raining at the moment. What a complete crock! A lovely or beautiful day is one in which the sky is essentially blue rather than grey. There may be a few fluffy white clouds to break what some (not me) could regard as the blue monotony but no more. It is one in which the sun shines more often than not producing golden light which enhances the colours of nature making them glow and sparkle. Birdsong should be audible above nothing stronger than a moderate breeze. It is a day on which I can wear something less than a fleece and not have to carry my waterproof. That’s a beautiful day. The morning was acceptable and our walk was very enjoyable. The rain spots ceased and the main rain held off until we had returned. It has now been raining for the last four hours and looks set to continue into the night. John – are you, ever so slightly, in danger of becoming a GOM? We should celebrate our eccentric weather! I prefer to think of it as being an ROM – a Rational Old Man.